What is Deep Art Effects? 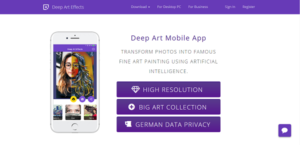 Deep Art Effects is an AI-powered image enhancement solution that transforms ordinary photos, selfies, and even video clips into attractive and engaging works of fine art. In just three quick and simple steps, Deep Art Effects turns any image into a high-quality art masterpiece. Users select the photo or video clip they want to use, choose the filter, let the software do its thing and voila! Users have an artistic rendition of their images that are “Instagrammable” or social media-worthy. Deep Art Effects is a perfect tool for business that wants to add that extra oomph to their sales and marketing campaigns. From commercials to still graphics to posters and more, Deep Art Effects provides business a platform that lets them fully leverage the power of artsy visual content. Deep Art Effects can turn any image or video clip into compelling works of art, regardless of format. You want to give more color to your selfies, add a few artistic elements to your photos, and turn your videos into highly attractive and entertaining clips, Deep Art Effects has got you covered. The whole process is easy and doesn’t require you to undergo hours and days of training to get the full gist of the software. Pick your picture, choose your format, and Deep Art Effects will do the rest. The results are instant and readily deployable for whatever purpose you have in mind, whether it’s conveying a message or empowering people to purchase your product or subscribe to your service. Or just get tons of likes from your followers on social media. Deep Art Effects is designed to function at an optimum level with your existing hardware and operating systems. Whether you are using Windows, Mac, Linux, even your mobile devices (both iOS and Android). You can trust on Deep Art Effects to create compelling works of art from your photo and video library. What Problems Will Deep Art Effects Solve? 1) Most photo editors sort of don’t allow the commercial re-use of the image, with Deep Art Effects you retain full ownership and as result can commercially use the crafted images. 4) Deep Art Effects offers High Data Protection According to German Standards while others don’t. No images will be stored. The rights always remain with the user. After processing, the images will be deleted. Our data traffic is encrypted and our platform exclusively works with European computer centers. If you are considering Deep Art Effects it might also be beneficial to check out other subcategories of Best Graphic Design Software gathered in our base of B2B software reviews. There are trendy and widely used solutions in each software group. But are they essentially the best fit for your organization’s unique wants? A trendy software application may have thousands of users, but does it provide what you require? For this reason, do not blindly invest in popular systems. Read at least a few Deep Art Effects reviews and think about the aspects that you want in the software such as the fees, main features, available integrations etc. Then, shortlist a few apps that fit your requirements. Try out the free trials of these apps, read online opinions, get explanations from the vendor, and do your investigation thoroughly. This in-depth homework is certain to help you select the finest software solution for your organization’s unique wants. How Much Does Deep Art Effects Cost? We realize that when you make a decision to buy Graphic Design Software it’s important not only to see how experts evaluate it in their reviews, but also to find out if the real people and companies that buy it are actually satisfied with the product. That’s why we’ve created our behavior-based Customer Satisfaction Algorithm™ that gathers customer reviews, comments and Deep Art Effects reviews across a wide range of social media sites. The data is then presented in an easy to digest form showing how many people had positive and negative experience with Deep Art Effects. With that information at hand you should be equipped to make an informed buying decision that you won’t regret. What are Deep Art Effects pricing details? What integrations are available for Deep Art Effects? Deep Art Effects offers limitless integrations via SDK. If you need more information about Deep Art Effects or you simply have a question let us know what you need and we’ll forward your request directly to the vendor.